"We are setting sail during a storm," said the new president, and founding family member, Akio Toyoda. 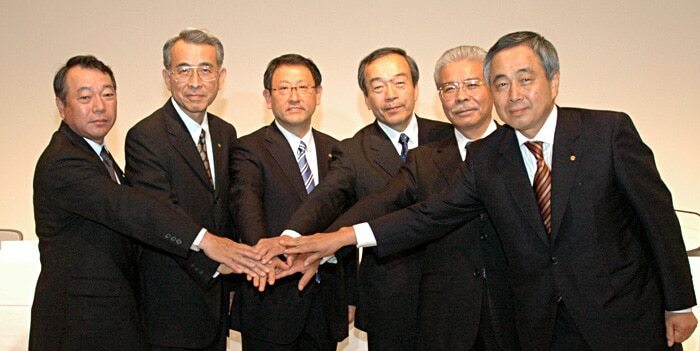 "We expect our losses to deepen this fiscal year," said Akio Toyoda, third from left. Akio Toyoda officially debuted as president of Toyota Motor Corporation today and said the company faces “two more difficult years. Toyota is now facing a record loss off ¥550 billion ($5.7 billion) this fiscal year, according to Toyoda, a member of the company’s founding family, who took over as president two days ago. The latest projected loss follows a record ¥437 billion loss in the previous fiscal year, which ended on March 31st. It was the first time a Toyoda has led the company in more than a decade, and Toyota’s widening losses, and plummeting share price prompted the change. “We expect our losses to deepen this fiscal year, and so all of us in the new management team at Toyota feel like we are setting sail during a storm,” Toyoda said at his first press conference. He said he would do his best to stop the losses after this year. “The way forward is clear,” according to Toyoda, who, at 53, is unusually young for a Japanese company president. “Yes, the going will still be tough for the next few years, but if all Toyota companies around the world come together and reaffirm Toyota’s mission, Toyota will bounce back. My immediate goal is to work from this low point in our business upward so we can return to profitability as soon as possible,” Toyoda said. He outlined two areas where changes would be made — building better cars, and meeting the needs of regional markets. Toyoda cited the recently released third-generation Prius hybrid as a prime example of what he means. Since Prius went on sale on May 18th orders have increased to greater than 200,000 vehicles, a record. Implicit in this shift in rhetoric, is also a tacit acknowledgement that Toyota has been pursuing sales-oriented strategies, rather than product oriented ones. However, Toyota’s recent decision to cut the price of the Prius in the United States, after the Honda Insight appeared as a less costly challenger, shows that the company will still use pricing incentives to defend its share. “The second thing I want us to focus on is making sure our management places priority on meeting the needs of regional markets. In other words, a management style that closely watches consumers and markets, notices changes, and allows those best acquainted with a particular market to make prompt decisions,” Toyoda said. Nowhere is the regional issue clearer than in the United States where Toyota’s pursuit of being a full-line automaker resulted in a disastrous foray into the production of full-size pick-up trucks and SUVs that has cost the company billions upon billions of dollars in ongoing losses. Perhaps even worse, the gas guzzling trucks damaged Toyota’s environmental reputation, as well as its business reputation as an astute marketer that anticipated customer trends. To rectify this, Toyota has put in place a group of new executive vice presidents who have responsibility for specific regions around the world. They will determine where the company will advance, and in non-growth areas, where Toyota needs pull back from its grandiose plans. Toyoda noted that sales in the North American market have collapsed, but with vehicle ownership at 250 million units and with the population increasing, he “firmly believes” this market will recover — albeit without the emphasis on the larger vehicles Toyota recently bet on. And while North America was once a major growth market, he implied it no longer would be. The same apparently goes for the European market, where limited success has been achieved after years of trying to increase sales and share there. “Instead, we need to develop a distinctive Toyota business model in the region so we are not lost in the crowd. In that regard, what distinguishes Toyota most is our hybrid technology,” Toyoda said. “So, as stricter environmental regulations come into place, we are gradually shifting our focus to the hybrid segment. We are confident that this will create a stronger position for Toyota in Europe,” Toyoda said. The real focus, though, will be in emerging markets, such as China, Asia and South America, which are now under one executive vice president, and where in the case of Asia Toyoda has personal experience. “These markets have amazing growth potential, and I can see that China will someday stand alongside the United States as a giant single market,” Toyoda said. He also said that the company would develop unique products for these markets, an apparent departure from its commonality approach that made it the world’s leading automaker. This entry was posted on Thursday, June 25th, 2009 at and is filed under Automobiles. You can follow any responses to this entry through the RSS 2.0 feed. Both comments and pings are currently closed.